tkTwitter CEO Jack Dorsey and Salesforce CEO Marc Benioff strongly disagree about Proposition C, a measure that would tax big businesses in San Francisco to fund homelessness services. A San Francisco measure on the ballot in November caused a stir among the tech elite on Friday. Proposition C would tax the largest businesses in the city to fund homelessness services. It could bring in $US250 million to $US300 million in revenue annually. Salesforce CEO Marc Benioff is a strong proponent of the measure. Twitter CEO Jack Dorsey used his social network on Friday to oppose Benioff’s support, though Benioff was quick to respond. Several of San Francisco’s most powerful tech CEOs publicly locked horns on Friday over a measure that would make the city’s largest businesses pay a greater share of the bill for homelessness services. 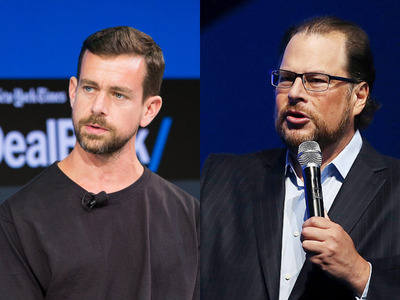 In a series of tweets, SalesforceCEO Marc Benioff, TwitterCEO Jack Dorsey, and the Irish-born CEO of Stripe, Patrick Collison, debated Proposition C, a measure on the ballot for voters in the city in the November election that would raise taxes on large companies to help San Francisco deal with an intractable homelessness problem. Benioff, who founded and runs the largest company in San Francisco, has endorsed Prop C, though it could ultimately cost Salesforce millions of dollars in city taxes. Benioff has issued a statement on Twitter and bought ads supporting the measure. The San Francisco Controller’s Office estimates that the tax would bring an additional $US250 million to $US300 million in revenue for the city each year and affect 300 to 400 local businesses; it would apply to those with more than $US50 million in San Francisco gross receipts, as well as companies headquartered in the city. In a tweet on Friday, Dorsey said he disagreed with Benioff’s support for Prop C.
Collison later voiced support for Dorsey. The exchange highlights what has become a thorny and embarrassing problem for San Francisco, where the sight of tents, human waste, and indigence is a jarring contrast to scooter-riding techies who work for some of the most valuable companies in the world. Twitter has been a long-standing target of criticism because several years ago it negotiated a controversial tax break as an incentive for it to remain in San Francisco and move into its Market Street headquarters. Benioff responded sharply to Dorsey, suggesting the Twitter CEO was not doing his part to curb homelessness.